When you’re viewing changes to a markdown file, you have the option to compare the rendered versions in the diff view. 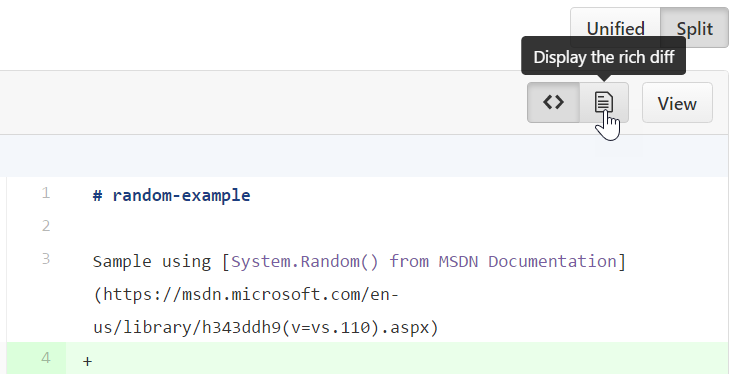 But suppose you wanted to view the actual rendered markdown file as a diff. Click on the Display the Rich Diff button located in the upper right. Now you’ll see the diff of the README.md file as a rendered file. 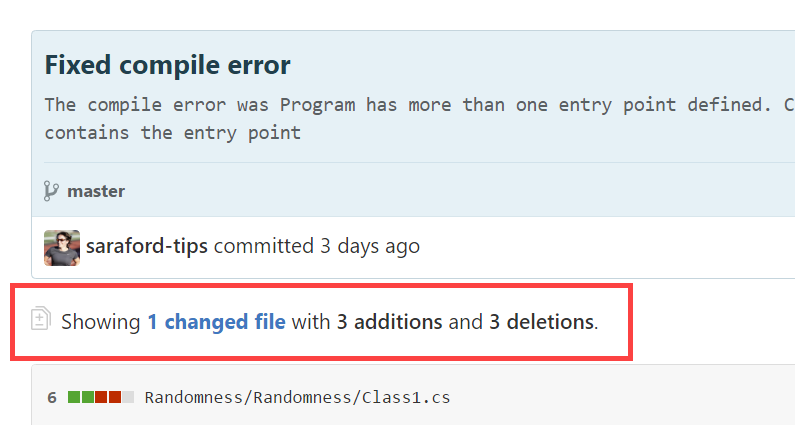 Suppose you want to see the last commit made to a particular file because you want to know what changed. Using my Masters UX project TheoryC as an example (it’s a Kinect app to do experiments in Kinesiology where you follow a ball around in a circle), let’s say you want to see the last changes made to the ViewModel. If you click on the ViewModels folder, you’ll see the MainViewModel.cs listed. Now in the upper right, you can click on the commit ID shown, which is the last commit ID for the given file. 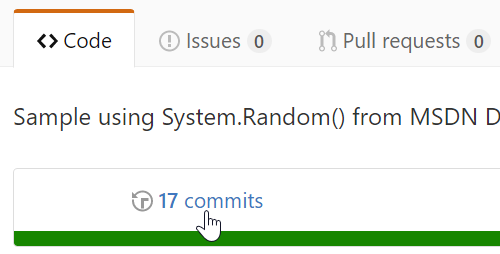 Clicking on this last commit shows the changes for that given commit. P.S. Now you’re probably wondering, “Why on Earth would you need to modify your DataLogger or even your MainViewModel to make your DebugWindow moveable?” Yeah, great question. I have the hardest time saving just one functional unit of change per commit. Learning good commit practices is hard when you’re working alone, because it’s easier to let this stuff slide. P.P.S. Since starting this series, I’ve learned through my research that you can actually add only certain files, one git add at a time, and commit just those! This solves my above dilemma. Stay tuned in mid-late February for how to do this! Personally, I’m not a fan of the inline diffs that make you do homework to figure out what’s being added and what’s being removed. You’re taken to a page that shows the diffs as inline or unified for the file. Fortunately, there’s a split button in the upper right hand corner that says Unified | Split. Clicking on Split portion of the button will show the before and after changes side by side, which is just my personal preference. Suppose you want to see what changed between two commits on a particular branch. First, you can go to the Code tab and change the desired branch (see previous tips on how to do this). and navigating to the desired commit, you can click on the commit id (as highlighted in the image below). Now you can see all the changes for that particular commit. I’m purely a visual person. I cannot put clothes into a dresser drawer. If it is out of sight; it’s out of mind. It’s that bad. Thus being able to view all the files in a repo for a given commit really helped drive home how Git is so different from other source control systems. Going back to my random-example repo, suppose you want to see the state of the repo as of the first commit on master. Now scroll all the way down to the original commit. You’ll see highlighted in the next image a <> button that displays a tooltip Browse the repository at this point in the history. Instead of branch:master or branch:readme-draft, you’re now seeing this Tree:ad98b093 thingy. You’ll see that this Tree:ad98b093 commit id matches the id in the far right. You might be wondering why the dropdown doesn’t show the list of all the possible trees to view. My guess is this list would be come unmanageable pretty quickly. And people probably don’t need to look up the state of a repo at a given snapshot very often. 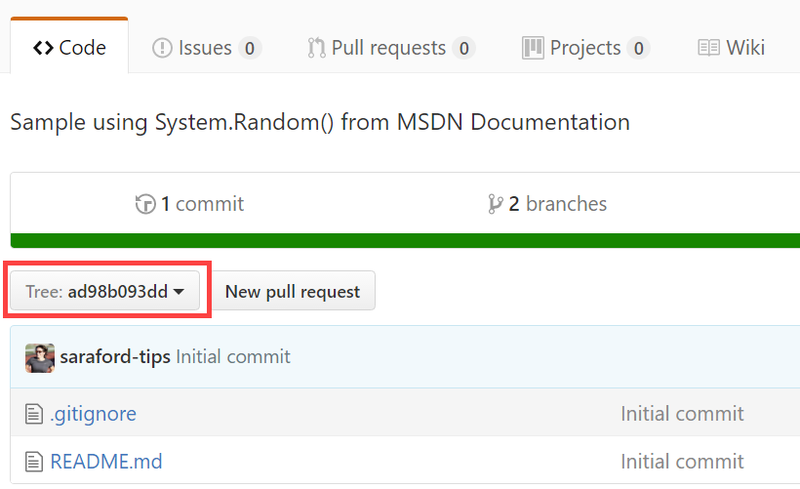 In yesterday’s tip, it was easy to find the desired Pull Request when there’s only been one Pull Request created. Today, let’s say that you want to restore a deleted branch, but you need to search for the Pull Request to get to the Restore button. Deleted branches aren’t shown on the Branches page. 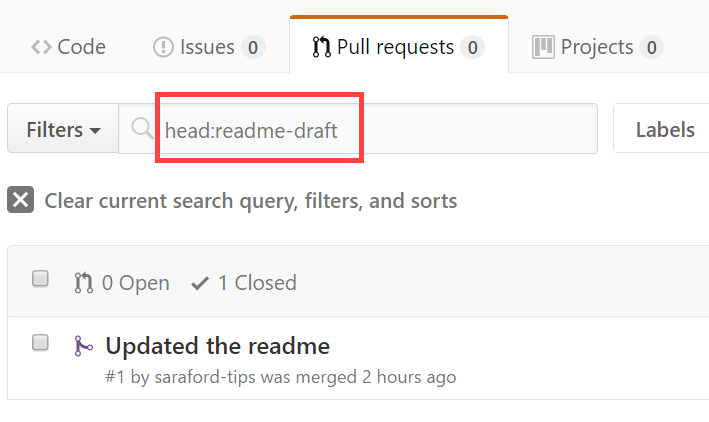 Notice you’re using head: as the search parameter because there are two branches involved in a Pull Request. The base branch is the branch that the changes are going into. The head branch is the source of those changes. And in the above screenshot, you see the Updated the readme PR that contains the readme-draft. You can also search based on base branch using the base:<branch-name> search option. Check out the search documentation for more information.